Michelle Jackson is an Irish Best-selling novelist, Broadcaster and Travel Writer . She loves to write about travel, and her novels are all set in wonderful locations that will make you feel as if you are travelling with the characters that she writes about. Her debut novel ‘Two Days in Biarritz’ was published by Poolbeg Press and made number two in the Irish charts in 2008. Her other novels ‘One Kiss in Havana’ and ‘Three Nights in New York’ have been translated into several languages including, Dutch, German, Norwegian and Portuguese. Since then she has written ‘4am in Las Vegas,’ ‘5 Peppermint Grove’ set in Perth, Australia and ‘Six Postcards Home’ set in Dublin, London and Spain. In 2015 she published ‘7 Wishes in Rome’ as an ebook and all of her titles can be bought in good book shops or online here. In 2010 Michelle co-wrote the bestselling popular psychology book ‘What Women Know,’ published by Hachette Ireland, which was the first Irish book to use Facebook to source contributors. 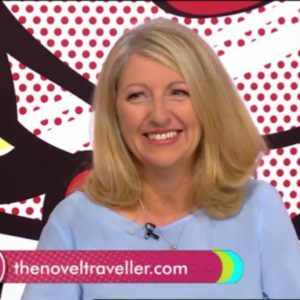 She writes for several Irish newspapers and magazines including the Irish Independent, The Irish Times, The Sunday World and Irish Mail on Sunday and has a popular Travel Blog which is kept up to date with lots of travel news. Michelle is a weekly contributor on The Hard Shoulder with Ivan Yates on Newstalk fm Travel Thursday. She is also bi-weekly Travel panellist on Virgin Media One’s Elaine, presented and produced by Elaine Crowley.